Rose-Hulman Ventures leverages the unmet technological needs of companies as an innovative way for undergraduates to gain professional experience. Multidisciplinary teams of students work in paid internships under the direction of full-time project managers and faculty, assisting technology-driven businesses in the design, prototyping, and testing of products and services. Students are challenged to broaden their thinking to become problem-solvers and communicate effectively with both technical and non-technical professionals. In other words, students do engineering. Each year, more than 200 internships are offered to students in most major disciplines, freshmen through seniors. Students can work full time during the summer and around class schedules and co-curricular activities during the school year. Deliver technical solutions in a well-equipped, 35,000-square-foot facility on the south campus of Rose-Hulman, just five miles from the main campus. A suite of neurosurgical devices to excise brain tumors and preserve the tissue for further testing. 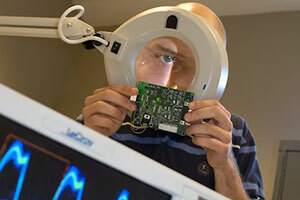 Diagnostic devices to measure kidney health and function in real time. Software to improve the efficiency and accuracy of recording and transcribing medical records. Second generation of a revolutionary breast biopsy tool. Software to evaluate the performance of various fuel injector designs. Technology to reduce dependence on fossil fuels. Systems to enhance agricultural science by evaluating success of various planting techniques. Why a Rose-Hulman Ventures Internship? On-campus Internship. Offer flexible hours around class schedules. Full time during the summer. Apply engineering skills in the context of real-world engineering projects. Assist technology-driven businesses in the design, prototyping, and testing of products and services. Work under the direction of project managers and faculty. Gain experience in teamwork and communication skills. Reinforce and enhance classroom knowledge through hands-on applications. Learn additional skills making students more marketable to recruiters.